During the War of 1812, Fort McHenry, sentinel of Baltimore's harbor, was bombarded with advanced weapons, including rockets, and on September 13, 1814. Francis Scott Key was so inspired as he watched the attack, that he wrote the "Star-Spangled Banner" in praise of the successful defense of the fort. Find out more about the author of the "Star Spangled Banner" in this book by Sam Meyer, Paradoxes of Fame: The Francis Scott Key Story. Visit with this interesting lawyer, leading lay-churchman, diplomat, humanitarian, poet, Attorney General for the District of Columbia and family man of the early 19th century. The charter that Lord Baltimore received from King Charles I of England specified a name for the new colony. It was to be called Maryland to honor King Charles' wife Queen Henrietta Maria (Queen Mary). This nickname is, according to some, a reference to the Maryland soldiers who fought courageously in the Revolutionary War, the Maryland Line. It is said that General George Washington referred to these soldiers as "The Old Line." Maryland was the only state that had regular troops "of the line" and these soldiers were ranked among the finest and best disciplined in the army. Another origin is given that goes back further in history. It is said that Maryland is referred to as "The Old Line State" because it was the dividing line between the land grants given to William Penn and Lord Baltimore. This nickname originated in an article written by Hamilton Owens, the editor or the Baltimore Sun. In 1923, a Georgia Congressman, William D. Upshaw, attacked Maryland as a traitor to the union because it never passed a State enforcement act supporting Prohibition. Hamilton Owens' article, "The Maryland Free State" was a mocking response to Mr. Upshaw, suggesting that Maryland should secede from the Union before acting to prohibit the sale of liquor. This article was never published but Mr. Owens referred to Maryland as "The Free State" in later editorials. This nickname, coined during the Revolutionary War, again refers to the Maryland soldiers. According to King's Handbook of the United States , 1891, the Maryland Old Line was made up of young men who "...wore brilliant cockades". Cockades are badge-like ornaments usually worn on hats. These decorations gave birth to Maryland's nickname, "The Cockade State." In the early 17th century, Baltimore was given the nickname of "The Monumental City" and this nickname was transferred to the state over time. 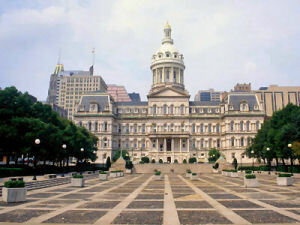 "The Monumental City" was bestowed upon Baltimore by President John Quincy Adams, probably in reference to the monuments he saw on his visit to the city in 1827. The "Battle Monument" honoring Baltimore's defensive victory in the War of 1812 was standing on the site of the old court house. Construction was under way on the first major memorial to George Washington. President Adams was also taken to North Point to view the Aquila Randall Monument erected to honor a member of the First Mechanical Volunteers of the Fifth Regiment who was killed on September 12, 1814. At a dinner engagement, Adams thanked the citizens of Baltimore for the kind reception he had been given during his visit and proposed a toast" "Baltimore, the Monumental City--may the days of her safety be as prosperous and happy as the days of her danger have been trying and triumphant!" This nickname referred to the large oyster fisheries in the state. Probably because Maryland was named after Queen Henrietta Maria, Maryland has been referred to as "The Queen State." People who live in or who come from Maryland are called Marylanders. The second commemorative quarter-dollar coin released in 2000 honors Maryland, and is the 7th coin in the United States Mint's 50 State Quarters® Program. The Maryland quarter shows the State House dome, located in Annapolis. The dome is surrounded by branches of leaves from the state tree (White Oak) and the state's nickname ("The Old Line State"). Some people believe General George Washington gave the state this nickname as a way to honor the Maryland Line troops, who served in many Revolutionary War battles. 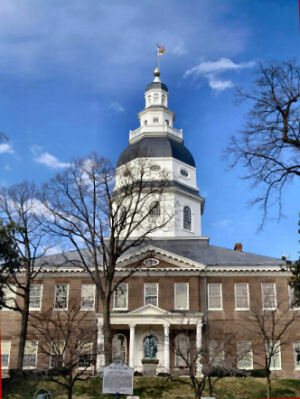 Maryland's State House is the oldest one still used regularly by a legislature. Started in 1772, the building wasn't totally finished until 1797. A lot happened during those 25 years to delay construction, including at least one hurricane and the Revolutionary War. From November 1783 to August 1784, the Continental Congress met in the unfinished state house, using it to sign the Treaty of Paris that ended the Revolutionary War. Maryland (From Sea to Shining Sea) , by Barbara A. Somervill. 80 pages. Publisher: Children's Press(CT) (September 2008) Reading level: Grades 3-5. Presents information about Maryland's people, geography, history, landmarks, natural resources, government, state capitol, towns and cities, and more. Maryland (World Almanac Library of the States) , by Michael A. Martin. 48 pages. Gareth Stevens Publishing (August 2002) Reading level: Grades 4-6. Filled with the most up-to-date information, including the latest Census results. 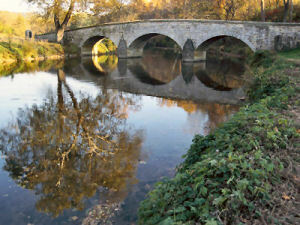 Full-color photos bring to life the story of Maryland. In addition to an in-depth factual profile of Maryland in the form of a state Almanac, this book offers fascinating and lively discussions of the state's history, people, geography, government, economy, culture, and lifestyles. A section on Notable People, a calendar of events, and enough primary source documents, time lines, maps, and other tools to make this unquestionably the best young adult reference material on the USA available anywhere. Maryland, A Middle Temperament: 1634-1980 , by Dr. Robert J. Brugger. 864 pages. Publisher: The Johns Hopkins University Press (September 1, 1988) A history of the third original colony with 350 years of tobacco culture, slavery, industrial revolution, civil war, and civil rights is a daunting task met by Brugger in his highly readable standard history of the state. Brugger not only covers the pageant of centuries but also finds a themeone of moderation and balance in a not-quite Southern but not-quite Northern realm where both cool heads and Union occupation prevented secession. Writing over the last three years, Brugger recognizes the findings of younger historians who have wrung fresh insights about colonial living from statistics and archaeology. He is not reticent about long-denied civil rights, old political machines, and fairly recent corruption.
" Good evening, I'm Ric Cottom. Welcome to Your Maryland." Since 2002, when he first delivered his now-classic radio segment on Maryland history, Ric Cottom has narrated hundreds of little-known human interest stories. Collected here are 72 of his favorite on-air pieces, enhanced with beautiful papercut illustrations by Baltimore artist Annie Howe. From accused witches and the murderous career of gunsmith John Dandy through tales of Johnny U and the greatest game ever played, Your Maryland covers nearly four centuries of the Free State's heroes and scoundrels. Entertaining listeners of all ages while sparking their interest in the past, Cottom's beloved Your Maryland is a unique blend of carefully researched regional history and narrative nonfiction. He deftly emphasizes the human dimension of Maryland's colorful past: its athletes (two- and four-legged), beautiful spies, brilliant writers, misunderstood pirates, and ghosts. All of that color, suspense, and humor - as well as the author's unusual talent for discovering interesting historical facts and personages - is part of your Maryland. The Colony of Maryland (Primary Sources of the Thirteen Colonies and the Lost Colony) Using primary sources, this book tells the story of the Maryland colony from its initial settlement through the Revolutionary War. Written by Liz Sonneborn, author of more than eighty nonfiction works for middle grade readers and young adults.